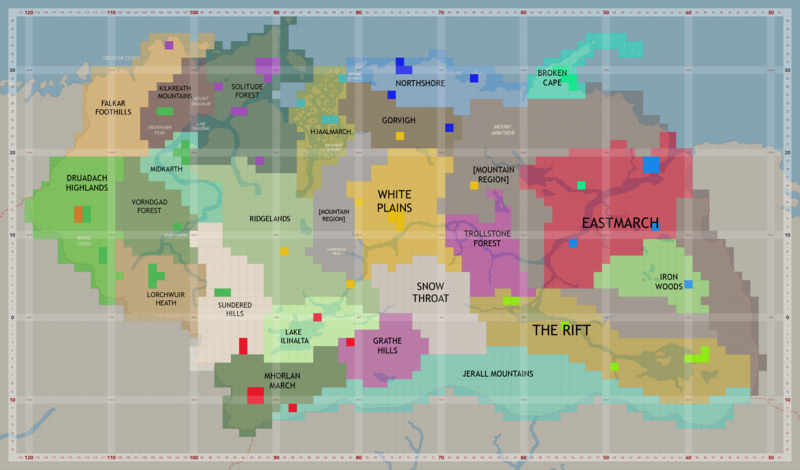 Here's a WIP proposal for the regions of Skyrim. It's a bit rough around the edges (and some cell borders need adjustment etc. ), but there's some ideas in here that I'd like input on. 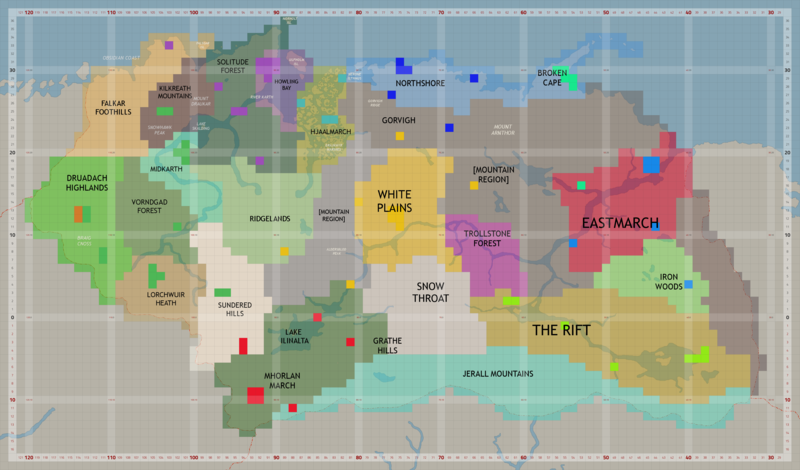 - Rename & expand Snowhawk region to include the larger Kilkreath Mts. chain. - A general idea to have "mountain chain" regions with individual mountains having their peaks as named cells instead of a mini-region for each one. - Merge Ridgelands and the "lime green plains"
I like it very much! Nice work. I'm also very fond of the idea of having mountain peaks as named cells. I believe the Falkar Foothills, if extending further to the north like that, should probably use a different region name. I've always seen the name as referring to the foothills of Snowhawk. I'm not terribly obsessed with the idea of renaming it, though. I wouldn't know a better name right now anyway. I'm working on a short description of each region. Because of the O-A thing? Both are lore-based names, and their locations are pretty specific as well. 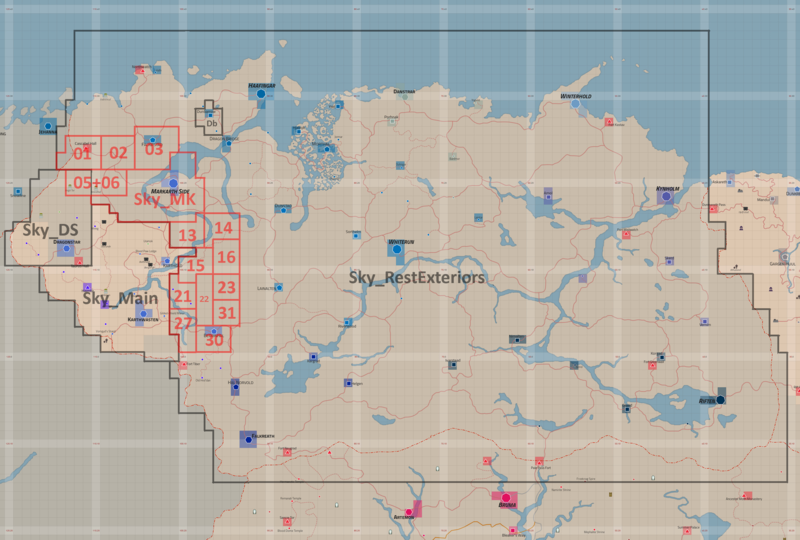 Based on the map, Falkirstad is no longer in the Reach, correct? I wouldn't mind that at all, actually. As it is, the Reach is rather crowded with settlements. Putting Falkirstad north of Snowhawk Peak will let us finish the Hold sooner. Good idea. Yes, I discussed my ideas with worsas and we agreed that it would make sense to put it in Haafinheim. First off, Falkirstad doesn't feel like it should be a Reach city when it comes to location or identity. It's sort of the odd one out. 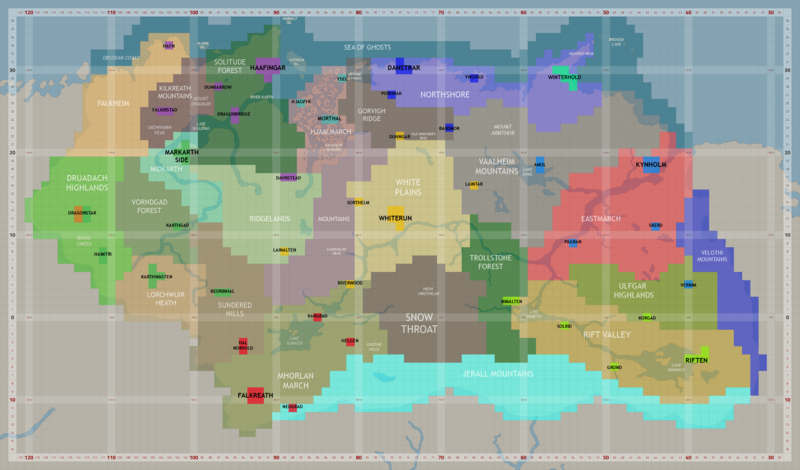 Secondly, The Reach is already saturated with settlements which are all very big and populous. Of course it is described as being the most cosmopolitan hold, but it will still be that now. Haafinheim could instead use some more 'power' outside of the capitol - Dunbarrow, Dragonbridge and Dunstad are all minor settlements. And with Haafinheim controlling the coastline, it would only make sense that they own Falkirstad. Just a few random questions. What happened to Ivarstead? Is Nimalten just taking place of it? It seems to be in the same location. Or is the decision just not to worry about including TES V towns given the lack of Rorikstead and Shor's Stone? Also, is there a reason that the Velothi mountains don't extend north to the sea? I believe it is mountainous all the way to the coast in Uld Vraech in TR. Similar thing for the Jeralls. Are they going to flatten out as they go west past Falkreath? Ivarstead might be there as a minor settlement, but not Rorikstead. In general we're giving Arena cities priority over later ideas. I was unsure about the mountains ending or not, so take it with a pinch of salt. If TR's mountains go all the way to the coast, so will ours. The Jerall mts. will generally flatten out around Falkreath, yes.